Phillies' Rhys Hoskins follows through on a two-run home run off Miami Marlins starting pitcher Vance Worley, Thursday, Sept. 14, 2017 in Philadelphia. 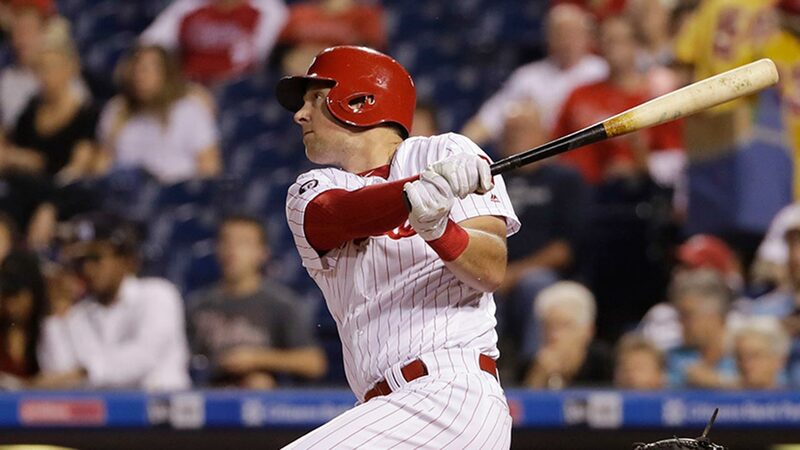 PHILADELPHIA -- Rhys Hoskins homered again and Freddy Galvis and Jorge Alfaro also went deep in the Phillies' seven-run second inning to lead Philadelphia to a 10-0 victory over the slumping Miami Marlins on Thursday night. Hoskins' two-run shot gave him 18 home runs in 34 games since his call-up from Triple-A on Aug. 10. The Yankees' Gary Sanchez previously held the record for fastest to 18 homers. Sanchez needed 45 games. Cesar Hernandez had four hits and Cameron Perkins also homered for the Phillies. Brian Anderson had three hits, including two doubles, for the Marlins, who lost their fifth in a row and 15th in their last 17 games. After watching his team slump through another defeat on Wednesday night, manager Don Mattingly decided to sit outfielders Christian Yelich, Giancarlo Stanton and Marcell Ozuna in order to give the Marlins' power hitters a chance to "reset." That's 104 homers and 299 RBIs out of the lineup. Vance Worley (3-5) got a spot start for Miami, as Mattingly wanted to push ace Jose Urena back a day. Urena will start Friday night's game in Milwaukee. That contest originally was scheduled to be played in Miami, but it had to be relocated because of Hurricane Irma. Alfaro led off with a 459-foot homer to the upper deck in left. Galvis then made it 5-0 with a two-run shot to right-center. And Hoskins awed the crowd of 16,302, as well has his teammates, with a two-run homer to right on an 0-2 pitch. Replays showed Phillies players and coaches making faces of amazement when the ball left the yard. J.P. Crawford hit a two-run single to center to make it 9-0. Dee Gordon of the Marlins extended his hitting streak to 17 straight games with a fifth-inning single to left. Philadelphia's Nick Williams singled in the fourth inning to give him a hit in 12 consecutive games.